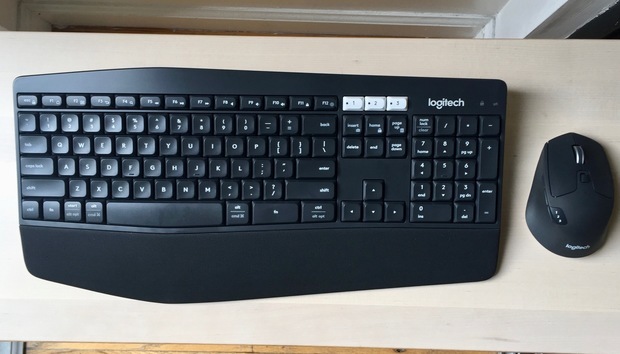 The Logitech MK850 clearly aims to be your go-to keyboard and mouse for your desktop, phone, and tablet. 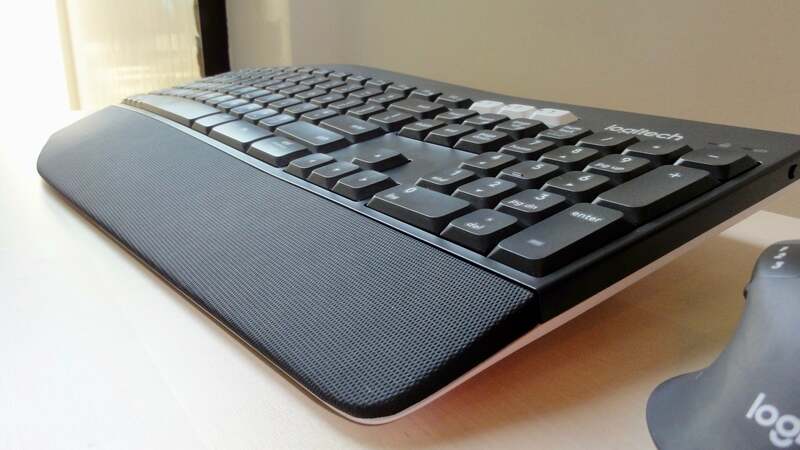 With its roomy, ergonomically minded design, the keyboard is also a gift to aching wrists. But while the MK850's agility at juggling wireless connections is impressive, the keys themselves feel disappointingly mushy. The MK850 certainly feels comfy thanks to its cushioned palm rest and the slight ergonomic bulge in the middle of the main keypad. Two pairs of fold-out feet tilt the MK850 to either four or eight degrees; personally, I stuck with the eight-degree pair. The Logitech MK850's padded palm rest makes life easier on your wrists. The keys themselves boast good travel and a soft, whisper-quiet touch, but not much in the way of snap. If you like getting a satisfying click from your keystrokes (I know I do), the MK850's keys might feel annoyingly mushy, particularly when it’s fresh out of the box. With time and repeated taps, individual keys on the MK850 began to feel slightly snappier, but lesser-used keys (like the function keys and those on the numeric keypad) continued to feel stubbornly squishy. Back on the plus side, the MK850's roomy design makes it easy to feel your way around the keyboard, and I appreciated how keys such as Start, Alt and Control automatically change function depending on whether the keyboard is connected to a PC or a Mac. Windows users (not Mac, unfortunately) also get seven programmable keys, to which you can assign functions using the downloadable Logitech Options app. The MK850 connects with up to three devices at once via Bluetooth 4.0 or a 2.4GHz wireless connection (a single wireless USB dongle is included). You can switch devices by tapping one of the three white "easy-switch" buttons to the right of the function keys. Pairing a device is a simple matter of pressing and holding one of the keys until its indicator light flashes. I paired the MK850 to my Windows 10 PC, iPhone, iPad, and iMac without any trouble, and the keyboard quickly restored its connection after periods of inactivity. While it can connect to phones and tablets with a minimum of fuss, the MK850 itself isn't particularly portable. With its feet folded in, the 1.6-pound MK850 is reasonably flat and barely an inch thick, but this 17 x 8.27-inch keyboard feels much more at home on a desk than crammed into a purse or a backpack. Like the keyboard itself, the impressive wireless mouse that comes in the MK850 "combo" package feels like more of a desktop mouse than a mobile-friendly mouse. Weighing in at 4.8 ounces, the 5 x 3 x 2-inch mouse isn't light or compact by any means, but the mouse's heft made for graceful sliding across my mousepad. As with the keyboard, the mouse can wirelessly connect to up to three devices. You can cycle through them by repeatedly clicking a button. 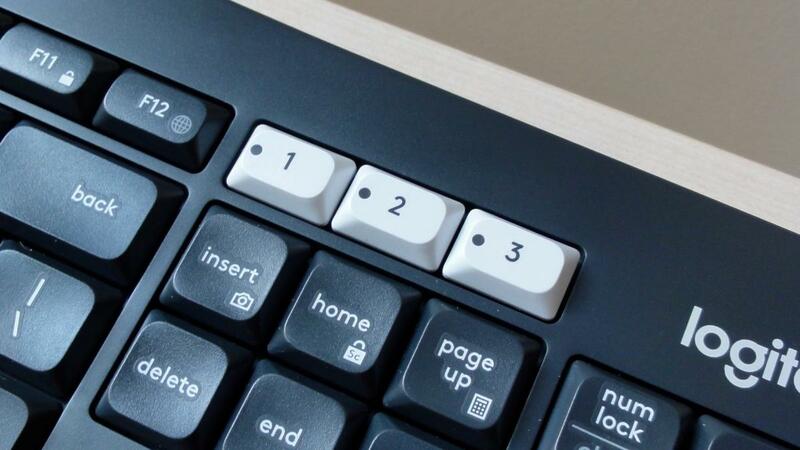 Both PC and Mac users can also program dozens of custom system and application functions to the mouse's various buttons and gestures, which you can engage by pressing a gesture button on the mouse itself or by holding the Fn key. My one complaint about the mouse is that the Forward, Back and gesture buttons are only on the left side, an annoyance for lefties. In the end, the Logitech MK850 keyboard and mouse combo makes for an impressive duo for desktop users looking to frequently switch devices, so long as you can get over the less-than-snappy keys on the keyboard.